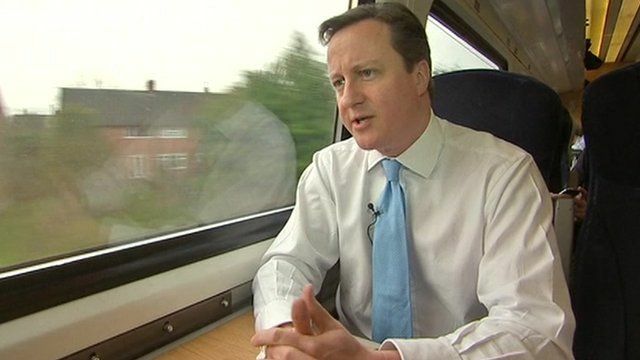 Cameron: HS2 is 'vital for Britain' Jump to media player Prime Minister David Cameron has said the extension of the HS2 high-speed rail network is "vital for Britain". 'Narrow economic benefits for HS2' Jump to media player The next phase of the £32bn HS2 high-speed rail network has been unveiled by the government, but the Institute of Economic Affairs (IEA) says the plan is a "basic economic error". 'No trust' in rail civil servants - MP Jump to media player A Conservative MP has criticised the government's proposals for the next phase of the high-speed rail network, saying he does not trust the civil servants in charge of the process. Will HS2 'heal north/south divide'? Jump to media player Professor John Tomaney, from the School of Planning at UCL, and Sir Richard Leese, chair of Manchester City Council, examine how the proposed route for the high-speed train network linking Birmingham to Manchester and Leeds will impact life in the UK. Prime Minister David Cameron said the scheme was "vital for Britain if we're going to succeed in the global race". The preferred route of phase two goes from Birmingham northward along two branches: to Manchester Airport and Manchester; and via Toton near Nottingham, to Sheffield and Leeds.